Mixed Incontinence: What Takes Precedence in Its Management? 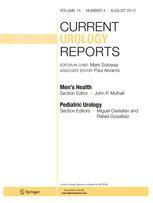 Patient Distress in Women with Recurrent Urinary Tract Infections: How Can Physicians Better Meet Patients Needs? What Is the Role of Additional Pharmacotherapy and Neuromodulation in Patients with Marginal Benefit from Botulinum Toxin Injection?